The U.S. Democratic Party and the Islamic Republic of Iran are using practically the same language to attack Republicans, according to news stories appearing in the Middle Eastern press. 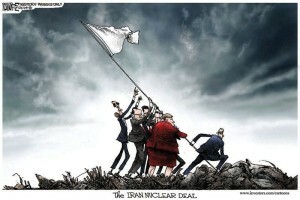 A firestorm erupted over the controversial letter to the Iranian government from 47 GOP Senators regarding the nascent nuclear agreement between the Iran and President Barack Obama. Democratic lawmakers have charged the Republicans with a variety of transgressions, such as Rep. Nancy Pelosi, D-California who accused Republicans of hurting national security. Others have said the letter was infantile, unnecessary, disloyal, illegal, or treasonous. Iranian officials have take a similarly hostile stance. Iran’s Supreme Leader Ayatollah Ali Khamenei said the letter “indicates the ‘collapse of political morality’ in the United States.” He told members of Iran’s Assembly of Experts that “the letter is an indication that the U.S. is ‘disintegrating’ from within,” according to the Tehran Times. Officer Darren Wilson: Free At Last!